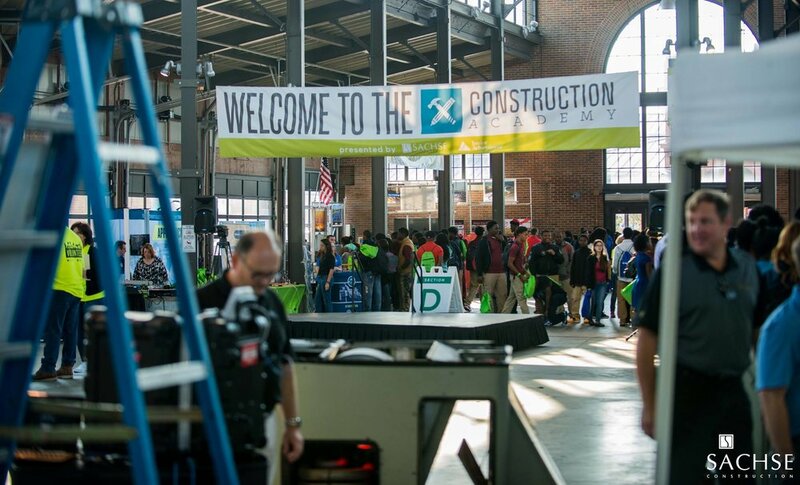 Presented by Sachse Construction and Junior Achievement of Southeast Michigan, the one-day academy provides a platform for 500 metro Detroit high-school students to learn about post-secondary skilled trade job opportunities. Students participate in hands-on training and demonstrations with more than 40 subcontractors and skilled tradespeople from across the state of Michigan and have the opportunity to meet with unions and vocational schools to explore construction trades as a rewarding career path. We hope to see you in 2019 at the fourth annual Sachse Construction Academy! Contact Jill Brack at jbrack@sachse.net for information on how to get involved at our next event. Thank you to our gracious sponsor, Shurtape Technologies, for your contribution at this year’s Sachse Construction Academy. One student participant will win a $2,500 scholarship to put towards a skilled trades education after high school. The winner will be announced on Friday, November 30, 2018. Good luck! View more information on this scholarship by clicking here. Lay the foundation of your future today by visiting Detroit at Work’s Sachse Construction Academy page. Here you can take the next step towards skilled trade job opportunities by learning more about your favorite trades before being placed into FREE skilled trade training programs. Charity Dean is the Director of Civil Rights, Inclusion, and Opportunity (CRIO) for the City of Detroit. Before taking on this new role, Charity was appointed by Mayor Mike Duggan to design, craft, and implement the Bridging Neighborhoods program based on a $32 million community benefits agreement for residents in Delray and Southwest Detroit. She currently serves on the board of YouthWorks-Detroit, Grandmont Community Association, and as an advisory committee member of the Detroit Women’s Leadership Network. Mayor of the City of Detroit Mike Duggan took office on January 1, 2014. As Mayor, he governs the city of his birth and where he spent the previous 32 years of his career collaborating with others to solve some of the city’s most vexing issues. During his career, he has taken on challenges and untangled problems that directly impact the quality of life of Detroiters, including access to health care, public transportation, crime, blight, expanding recreational opportunities in the city, job creation, and more. As city finances stabilize and public services continue to improve, the Mayor is now focusing on economic growth in the city and creating pathways to opportunity for Detroit residents. Kandace Jones is the President and CEO for Junior Achievement of Southeastern Michigan (Detroit). She has extensive experience working with the federal, state, and local education agencies; nonprofits; and the private sector. For the past six years, she has served as an expert consultant, facilitating professional development, organizational capacity-building, strategic planning, policy development, best practice research, communities of practice, sustainability planning, among other forms of technical assistance, for social entrepreneurs, state departments of education and school districts. In 1991, Todd Sachse founded Sachse Construction, a premier national commercial construction firm licensed in all 50 states, Puerto Rico, and Canada. For over 26 years, Todd has driven Sachse Construction to successfully complete millions of square feet of commercial, institutional, multi-family, and industrial projects throughout North America. Locally, the firm has led several of Detroit’s most notable construction projects, including Whole Foods, the Nike Community Store, Quicken Loans Headquarters, and renovations to the Detroit Athletic Club. When Rick Snyder became Michigan’s 48th Governor in 2011, he pledged a commonsense approach to governing that focused on working together to find solutions for the state’s toughest problems. With the self-proclaimed moniker “one tough nerd,” Governor Snyder has focused on making government more efficient and effective for Michigan’s citizens. Raised in a Battle Creek home known for a strong work ethic and service to others, Governor Snyder’s upbringing has aided in leading the state’s comeback. A homemaker and a small business owner, his parents demonstrated the value of hard work. Your contribution is tax deductible and as a partner, your company will be featured on our event video screens, program books, and on the Sachse Construction Academy website. Thank you to our 2018 Construction Academy Donators!